Join the discussion on our forums! 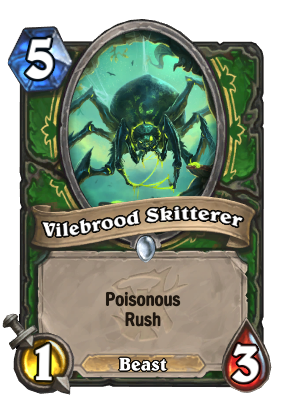 Come discuss Vilebrood Skitterer over in our dedicated Vilebrood Skitterer discussion topic. It aspires to be a Vilebrood Dancer, but it has eight left feet. Even in baku odd decks, wasp and Stoneskin Basilisk [/card] are far superior. This card is essentially a [card]Magma Rager pack filler. I would totally play it if it was 4 mana. So this is technically an Assasinate that might leave a poisoinous beast on the board. Also,theoretically, it might fit in some slower hunter decks. Alleycat and Kindly Grandmother will be rotating out though, so in standard at least this would be worth considering. Jeweled Macaw can be cut fairly easily. But then again I personally can't think of other reasons to put Master Oakheart in a hunter deck off the top of my head and even this card hardly seems worth the trouble. 5 mana kill a minion is terrible? does chat just want to see broken overstated cards just because hunter is not the king of hs? It's terrible because hunter probably wouldn't play it even at 3 mana. It's considerably worse than Purify because that card at least seen some play. Btw I think Hunter gets really nice cards in expansion otherwise, which is great. Trogg Gloomeater seems better even without the Beast tag. I'd say the Rush is a lot better than Taunt personally. Also I once created a very similar card, just with 2/2 and charge. I guess this replaces Dispatch Kodo in the DK?